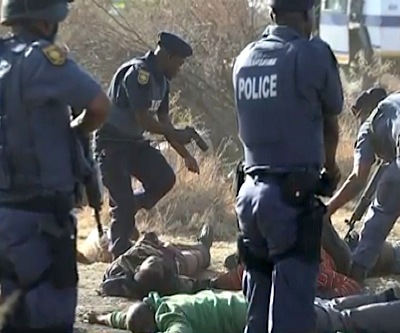 A 13-minute video taken two days after South African police shot 34 protesters at Lonmin’s (LON:JSE) Marikana mine last year, shows a commander congratulating his officers at the police base in Rustenburg for what he qualifies as a precise plan execution, Sowetan newspaper reports. “From the planning to the execution was 110 percent,” Brigadier Adriaan Calitz allegedly says in the footage. “I have to congratulate you. Exactly how we planned it and we briefed the commanders. Exactly we executed in that line.” Calitz gave the order to fire, according to The Daily Maverick. Officers had originally said most of the miners died when they opened fire as the strikers charged them. They also indicated they had turned in all evidence to the commission. But the video is part of new evidence recently discovered by the commission of inquiry that has been leading the investigation on the deadly incident. The brigadier’s comments may be considered a contradiction to the testimonies given by police after August 16, 2012. So far not a single police officer has been arrested in connection with the event.